The LASIK Center of the University Clinic Manheim is located directly at the Neckar River and is easily accessible by either public transportation or by car. Autobahn A6: Use exit "Mannheim - Mitte", turn onto A656 towards Mannheim. Take the first exit "Mannheim - Freudenheim" and remain on this highway until it ends (highway will pass over the Neckar River). At the traffic light, take a left onto Freudenheimer Straße. After approx. 1 km, make a left into the parking garage of the Clinic Mannheim. 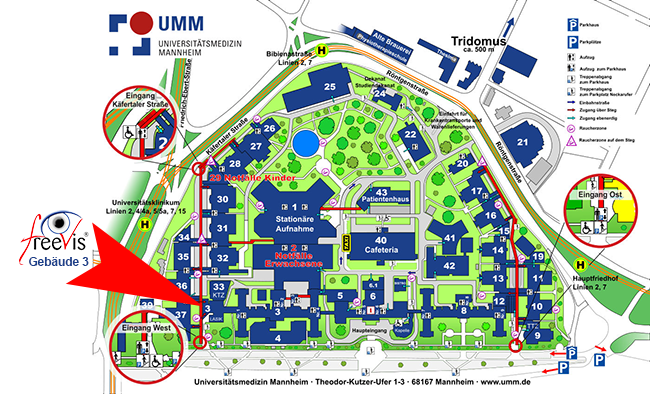 The FreeVis LASIK Center of the University Clinic Mannheim is located in House 3 on the second floor. From the Mannheim Central Station, take either a taxi (driving time approx. 5 - 10 min.) or S-Bahn 5 or 7. From the main entrance, keep left. The FreeVis LASIK Center is located in House 3 on the second floor.